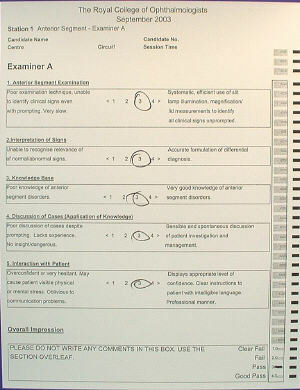 The form below is used by final MRCOphth examiners to evaluate candidates' performance. The mark ranges from 1 to 4. 3 is the minimal score for a pass. normal/abnormal signs. <....1...........2...........3.............4....> Accurate formulation of differential diagnosis. Poor discussion of cases despite prompting. No insight/dangerous. <....1...........2...........3.............4....> Sensible and spontaneous discussion of patient investigation and management.